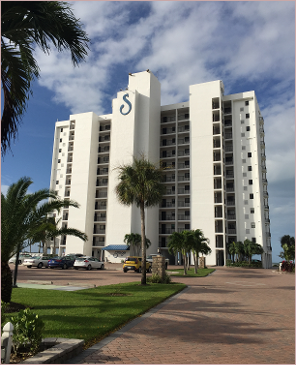 Sunset Condominium is Located on the South End of Ft Myers Beach. Located at 6400 Estero Blvd. Nowhere on the Island is there a more beautiful stretch of White Sand Beach than in front of the Sunset. The building was erected in 1979 when the only access to the island was a swing bridge. Now the beautiful Skybridge brings you right in to the Time Square area at the North End of Estero Blvd. Great little shops, gambling and dining Cruises, dining outdoors, and fishing from the pier along with the very active beach front are huge tourist attractions. There is a rich History to the Island and the surrounding areas where everyone can find enjoyment. The Resident Owners of Sunset are very proud of what the area has evolved into Since 1979. The changes in the last ten years alone have been enormous. Please if you visit the area make sure you see the entire Island to appreciate the great beauty of the Beach, and marvel at the wonderful site of the Gulf at Sunset. If you want to know more about Sunset and its property, please visit the pages of this website to find out why Sunset is the place to be on Fort Myers Beach.